Well, what a crazy but musically rewarding month March has been. With the USA tour and the Holy Week Festival at St John’s Smith Square taking up much of the month, I’ve found a bit of time post-Easter to reflect on some of my recent experiences as an Associate Artist this year. At the beginning of March, I was thrown in at the deep end by joining Tenebrae on their tour of the USA, performing Joby Talbot’s Path Of Miracles – my first time singing the piece in its’ entirety. And what an incredible piece it is to sing..! The first performance of tour was in Pittsburgh for the American Choral Director’s Association, so a nice chilled gig to start with after a long day of travelling the day before… Nevertheless, we got our acts together and entertained the massive audience of choral music fans (I even got asked to have a photo taken with a group of fellow choir geeks afterwards – closest I’ll probably ever get to feeling like a ‘celeb’). It was thrilling to finally be able to perform such a magnificent work with a wonderful group of singers, even when the nerves kicked in for the 2nd movement, Burgos, which is alto-solo central! The following four performances in St Louis, Dallas, Ann Arbor and Princeton were just as exciting, and joining forces with the choirs of Rosati-Kain High School, St. Louis University High School, Highland Park United Methodist Church chamber chorus, the University of Michigan chamber choir, Princeton University Glee Club, and Morse Chorale over the course of the week to sing Owain Park’s Footsteps was a great experience. The tour ended for a few of us with a spontaneous trip to New York for 6 hours before our flight home that evening. Who needs sleep anyway?! After a few days of recovering from jet-lag and major post-tour blues, the prospect of a ridiculously busy Holy Week started to loom. The week kicked off on Palm Sunday with a performance of Pärt’s Passio at St George’s Bristol with musicians from Aurora Orchestra. It was great to hear my fellow colleagues in solo roles: Nick Madden (Pilate), Jimmy Holliday (Jesus – complete with epic beard! ), and the solo quartet made up of Emilia Morton, Hannah Cooke, David de Winter, and Stephen Kennedy gave mesmerising performances. Next up was a 10 minute stint on BBC Radio 3’s In Tune to promote the Holy Week Festival – we showcased some of the repertoire that we were going to sing in the late-night liturgical events later in the week including movements from the Tenebrae Responsories by Victoria and Polish composer Paweł Łukaszewski. This led into Wednesday, the first day at SJSS, which included a repeat performance of the Passio and then straight into the first of three late-night events. There was something quite incredible about singing in somewhere as big as SJSS at 10pm – the candlelight and smallish congregation combined with short biblical readings and the powerful music of Łukaszewski’s Lamentations and Allegri’s Miserere made for a very atmospheric setting. Thursday was a big day for us Associate Artists: Messiah solo day! For me, it was a fabulous opportunity to solo in such a great space alongside my awesome colleagues and accompanied by the fine musicians of the Chartwell Sinfonia. The 100+ strong Come & Sing choir conducted by our very own Nigel did a great job too. As soon as we came off stage, it was time to prepare for late-night event number 2 which ended with Bruckner’s Christus factus est. 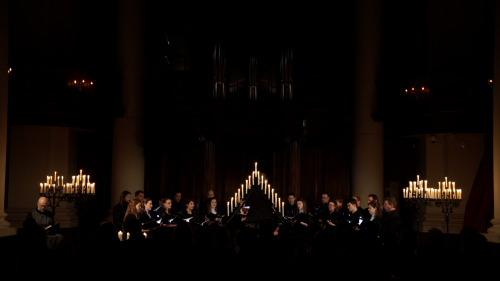 Friday saw the 3rd late-night event and the end of Tenebrae’s performances in the Festival. I think this event was my favourite out of the 3. The setting was more intimate as there were just 10 of us singing Victoria’s beautiful Tenebrae Responsories and O vos omnes by Łukaszewski, and the reflective plainsong singing from the guys was a great ending to a sensational few days of music making. As an Associate Artist, part of the post is to help develop Tenebrae’s link with education and community partnerships through leading workshops – something which I pretty much had no experience with beforehand so it was a slightly daunting prospect. Six months in and I think I’m getting to grips with the ‘leading’ side of things. It’s been wonderful to work as part of such a supportive team (thank you, fellow Associate Artists) as we start to develop a structure for going out and delivering workshops to groups of singers of a whole array of musical abilities and ages. One partnership which I have thoroughly enjoyed so far is that of Music Centre London, directed by the wonderful Richard Frostick. His infectious enthusiasm and love for what he does really put me at ease during the first couple of workshops (where I was a bag of nerves! ), and the children in his choirs are so attentive and have been such a joy to work with. I’m looking forward to continuing to work with Richard and his choirs over the next few months, culminating in the end of year concert at Union Chapel on 8th July. We’ve also had great fun learning the tricks of the Choral Leadership trade with guidance from Rachel Staunton and Dominic Ellis-Peckham. Having been conducted by both of them for many years whilst singing in the National Youth Choirs of Great Britain, it’s been an interesting and rewarding experience to work with them on the other side of the music stand and gain more knowledge and skills which I can implement into my future leadership work. Beth, James and I had the opportunity to put our new skills into practice when we worked with Morse Chorale during our trip to Princeton at the end of our USA tour. After our very energetic warm up (cue a lot of jumping around and musical games), we workshopped Owain Park’s Footsteps alongside Nigel, and it was fascinating to see how the young singers embraced everything we threw at them! Having admired Tenebrae for a long time, it has been a real privilege to sing and work with such a talented group of musicians over the past six months. Not only have they been super supportive and welcoming colleagues; they are just a top-notch bunch of people to spend time with and I am learning a lot. Bring on the next six months! Follow this link to find out more information regarding Tenebrae’s Associate Artists Scheme and how to support these young professional singers at the start of their careers.